It’s a wonder that anyone has any space left on their wrists with the number of activity trackers, fitness aids and smart watches Not The Apple Watch: 9 Other iPhone-Friendly Wearables Not The Apple Watch: 9 Other iPhone-Friendly Wearables The announcement of the Apple Watch was big news, but it's far from the only wearable device designed to be used with an iPhone. Read More that have been released in the last few years. While most of these demand to be worn at all times, today we’re taking a look at one that doesn’t: the Moov. 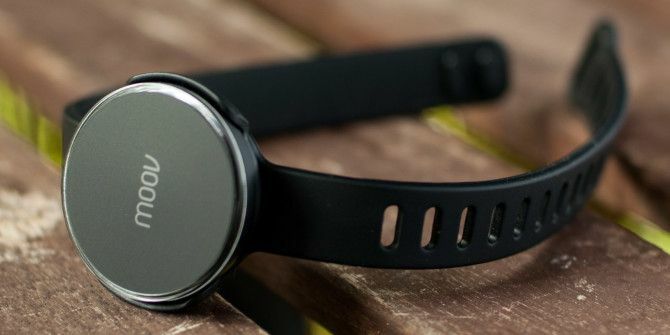 A fitness tracker by design, Moov began accepting pre-orders in February of last year; going against the grain of using a platform like Kickstarter Forget Kickstarter: How To Crowdfund From Your Own Website Forget Kickstarter: How To Crowdfund From Your Own Website Crowdfunding has taken off in a big way in the past few years. But you don't need to use a service like Kickstarter if you're already running your own popular website. Read More to secure funding. It’s a fitness coach that’s designed to train you in various physical activities – but is it any good? I’ve worked up a sweat to find out. The Moov is not a device that is designed to be worn at all times; it takes on the role of fitness tracker, rather than activity tracker. This means it won’t measure your heart rate, or count your total daily steps and nor will it monitor your sleep quality. You’ll still want to rely on wearables like the Fitbit Flex and Jawbone UP Fitbit Flex vs. Jawbone UP: A Comparative Review Fitbit Flex vs. Jawbone UP: A Comparative Review In today's world, nothing escapes the fact that we are moving in a direction where quantifying and recording stuff obsessively is sort of the norm. We use Foursquare to check into places, we annoyingly take... Read More , or Apple’s upcoming iWatch in order to do that. Instead, the Moov is a device that you wear when you specifically want to do exercise. 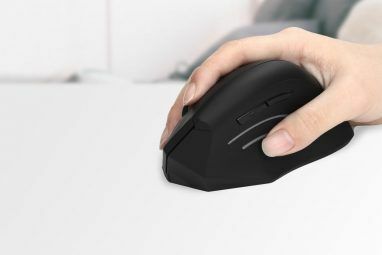 It connects to your smartphone and provides realtime feedback based on your current performance. At present iPhone users are well-catered for, while Android support is limited. The Moov team seem pretty convinced that their disc-shaped device can replace a personal trainer, and at $119 (currently down to $89) for a single unit it could potentially pay for itself within a few sessions. Of course, the Moov might not have the same motivating effects that come from social interaction – Her this is not. The device itself takes the form of a watch-like disc, which snaps into the included silicon wrist and ankle bands. This isn’t the most discreet device of its kind, but what it lacks in portability it makes up for in its ability to measure physical exertion. In the box you’ll simply find the Moov, two bands, a USB charging cable and a leaflet that tells you to go to the Moov website to get started. The unit itself takes the form of a circular disc that’s about the circumference of a table tennis ball, available in all-black and all-white with a ring of multicoloured LEDs running around the outer rim. To pair your Moov with a smartphone, you first press the face till you feel a click and the lights begin to flash, then select it on your smartphone. You can choose which colour you’d like your Moov to be while in-use, which is actually useful way of distinguishing multiple units from one another. And if you’re thinking “why would I need two?” then you’re probably not familiar with one of Moov’s designated activities – boxing! Moov snaps into a designated polycarbonate slot in the included wristbands, and though sometimes it takes a little patience to find the right spot it doesn’t feel like it will fall off easily once securely fastened. Similarly, the charging station can be a little temperamental, requiring you adjoin two small metallic contacts on the back of the device. Ultimately this shouldn’t put you off, the unit is solid, smaller than many watches and comfortable enough to wear thanks to soft “food-grade” silicon. Unfortunately this doesn’t make it the most breathable of materials, which means you’re going to sweat profusely wherever you choose to wear it. The device is waterproof though, so perspire away! The Moov is a fairly accurate bit of kit, which is to be expected when a product is designed as a tracker for fitness, and fitness alone. Utilising a Bluetooth connection, the Moov feeds back realtime information to your smartphone which you can make use of straight away if you’re running, walking, boxing or body-weight training. It does this using 9-axis sensors (an accelerometer, gyroscope, and magnetometer) to measure your form, cross-references it with how you should be doing it and providing tips on how to improve. In my testing, the best application for this sort of technology is for running and walking – where cadence (steps per minute) is measured fairly accurately and can be used to immediately improve your form. When using the Moov Run & Walk app, you will hear audio queues designed to help improve your techniques and conserve energy so you can run further, for longer. I was frequently reminded to take shorter steps, which really helped me keep up with the app’s expectations. As someone who hates running, the feedback provided by the app kept me focused and I found myself robotically following its instructions. In walking mode it’s great to see your pace displayed on the screen in front of you, particularly as the app uses interval training to set attainable goals. It’s an ideal platform if you know little about training, and ideal if the only thing you care about is getting some exercise done without having to plan your sessions. However when it came to bodyweight training, Moov’s 7 Minute+ app (based on the popular 7 minute workout Use Free 7 Minute Workout Videos To Get Into Shape [Stuff to Watch] Use Free 7 Minute Workout Videos To Get Into Shape [Stuff to Watch] There are lots of YouTube videos that can show you exactly how your workouts should be going, and they won't cost you a penny. Read More ) didn’t seem to recognise all of the reps (in particular squats). There was little in the way of personalised feedback, instead opting for general advice about keeping your back straight during a plank or jumping beyond shoulder-width for a star jump. I was also at somewhat of a loss as to where I should put my phone during these sessions, particularly as they are accompanied by example videos for you to follow (though once you’re familiar with the moves, you can rely on audio queues alone). One big issue I had with the Moov apps I tested was the lack of a “pause” feature, particularly bothersome when it came to the 7 minute workout. When the postman rang the door to deliver a parcel, the app told me “we’ll come back to those later” with no way of manually pausing the workout. There are four apps available for use with Moov, each targeting a specific activity. Probably the Moov’s best implementation, the Run & Walk app provides four separate activities for you to power your way through. Brisk Walking is great for warming up, those suffering from injury who still want to keep moving and as a demonstration of the level of accuracy achieved by the Moov team. Running Efficiency focuses on long distance, low impact exercise and aims to improve your stamina. Sprint Intervals focus on the opposite – short sharp bursts aimed to get your overall speed up. The final program known as Speed Endurance combines the two. The boxing app is unique in that it requires two Moov units, something we didn’t have available for testing. The app provides virtual targets for you to punch on your iPhone, with variable difficulty in terms of speed. You’d better have some way of propping your phone up, because you’ll need to be able to see the screen while exercising. It’s a sound concept, and the accuracy of the Moov seems well applied here – if you can stomach the price of two units. As previously mentioned, the 7 Minute+ app uses the popular repetitive cardio exercised published in the American College of Sports Medicine Journal and popularised by the New York Times. It doesn’t seem as well-implemented as the Running and Walking coach, though it’s nice to have someone else counting your reps for you. When you near the end of a set, the Moov will switch to motivational lines like “two more to go” and “you’re stronger than you think” but it didn’t feel personalised, and thus less motivational than running. It’s a nice bonus, but you could get the 7 minute workout done on your own terms and you wouldn’t be missing out (unless you’re a sucker for graphs and historic workout data). Another interesting use for the Moov (and another reminder that it is indeed waterproof) is for swimmers. Of course, this mode again pales in comparison to the Run & Walk app in that it does not provide realtime feedback – and for good reason, most people lack the waterproof housing required to strap your iPhone to your arm and go for a swim. So the swimming app simply records your swim – a boon for statistic nerds – and provides some limited advice on improving form. It’s great if you’re a competitive swimmer, particularly as the unit records lap times, but for the casual user it probably doesn’t justify the expense. Unfortunately Moov does not integrate with HealthKit, Apple’s bundled health-tracking technology that was added to iOS 8. On newer devices HealthKit already tracks metrics like daily step count and altitude (displayed as flights of stairs climbed) – the ability to capture the highly accurate exercise data from the Moov would be fantastic. In that respect, it seems like the technology at present has limited use. The Moov apps fulfill their roles adequately (though Walk & Run is the only cross-platform app, and arguably the main reason to buy), but they could be so much more with a little more software behind them. Hiking, cycling (coming soon apparently) and even martial arts are all areas left for the team to support. Things have started to stir on the Moov Developers website, which hints at the release of an upcoming software development kit that would allow Moov owners to use their devices to control games and other inventive applications; but these depend entirely on third party support (which may never materialise). Focusing on what the Moov can do, the fitness tracker is ideal for runners in need of motivation and improvement – it positively shines in this respect. It’s also a boon for sporty types who thrive on interval training, or serious athletes interested in shaving seconds off their swimming lap times. While it’s certainly possible the Moov could replace your running coach, it doesn’t react in quite the same way as a human would. Advice is useful, and personalised to an extent, but telling you to “imagine you’re running on hot coals” in order to get your pace up while you’re giving it your all can at times be frustrating. Moov’s instructor also doesn’t sound particularly human, which can be jarring to begin with. That said, I preferred this computerised voice to the repetitive soundbites used by FitStar Forget The Gym, Get Fitstar Fit With Your iPad Or iPhone Forget The Gym, Get Fitstar Fit With Your iPad Or iPhone If you don't get enough exercise there's a good chance you'll be expiring long before the rest of us – and you don't want that, do you? Read More which get very old, very quickly. If you’re a runner in need of a coach but don’t fancy throwing hundreds of dollars at your fitness habit then you should consider Moov. It’s highly accurate, motivational and provides a set of interval exercises to work your way through, recording your fitness journey as you progress. You can also then use the unit to take advantage of the 7 Minute+ bodyweight training regimen, but it must be said you could probably get similar results without having a sensor strapped to your wrist. Swimmers obsessed with improving performance area also well-catered for here, and if you’re someone who takes your pooltime seriously, the $90 entry fee probably doesn’t seem that steep. At its present stage of development, with only a few well-implemented mobile apps (the bulk of which are exclusive to iOS), the Moov is an impressive bit of kit that’s let down by insufficient software support. I don’t doubt there’s plenty of potential left in the technology, but it’s going to take some realisation before it has mass-market appeal. Explore more about: Health, MakeUseOf Giveaway, Wearable Technology. I think there's a problem in the sharing widget under "Refer Friends for Extra Entries". There's no link back to this giveaway. Anyway, thank you so much for this giveaway! Its Good!! like it !